Do Certain Foods Lower ALT Liver Enzymes? Elizabeth Patton is a Clinical Dietitian and Certified Diabetes Educator who has been writing since 2005. Her work has been published in the "Murray Ledger & Times," "Clinical Skill Builder for Food and Nutrition" and she is editor of Saint Anthony’s Medical Center's diabetes e-newsletter and blog. Patton holds a Master of Science in nutrition from Murray State University. The liver is a football-sized organ in the abdomen responsible for processing nutrients and waste products from the blood. Alanine aminotransferase, or ALT, is an enzyme the liver releases in response to damage or disease. ALT is measured on routine liver function tests. Damage to liver cells will release higher than normal levels of these enzymes into your blood stream, where they are measured. Elevated liver enzymes may indicate inflammation in the liver or liver disease, such as nonalcoholic steatohepatitis (NASH), fatty liver or cirrhosis. Modifying your food choices may help lower ALT, indicating a well managed and healthy liver. A nutrient-rich, plant-based diet is recommended to treat elevated liver enzymes. You should include a variety of whole grains, fruits, vegetables and low-fat dairy products in your diet since they are rich in vitamins and antioxidants and low in fat. 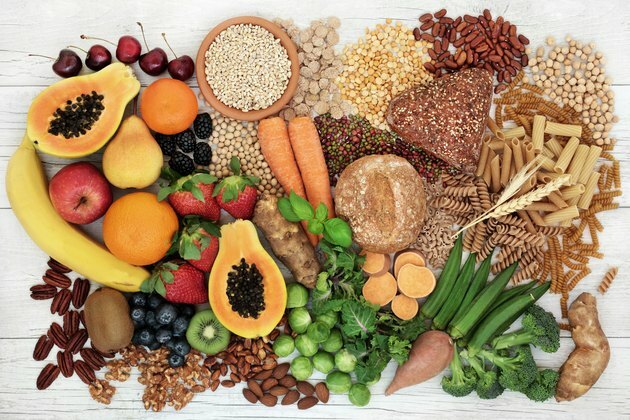 Berries, green leafy vegetables, peas, potatoes, oranges and beans are excellent sources of fiber, which has also been shown to help normalize liver enzymes. Balance your meals with smaller amounts of lean meats and plant fats such as olive oil and nuts. Limit high-fat foods, especially those coming from animal sources. Higher-fat foods increase fat levels in the blood, which may be deposited in the liver and cause the damage that raises ALT. High-fat meats include bacon, sausage, bologna, salami and hot dogs. Choose lower fat dairy products instead of whole milk, full-fat yogurt and ice cream. Eggs and cheese should be eaten in moderation. Limit restaurant foods, which also tend to be hidden sources of large quantities of fat. Alcohol and certain medications may cause further liver damage. It is best to avoid alcohol completely and eliminate any medications that are not necessary. Ask your doctor about the medications you are taking or are planning to take, including over-the-counter drugs and supplements. Elevated liver enzymes and certain liver diseases, such as NASH and fatty liver, occur most often in persons who are overweight or obese. A primary strategy for improving liver enzymes is to reduce weight through a balanced diet and exercise. Aim for at least 30 minutes of aerobic activity daily. If you have not been exercising routinely, start slowly and increase the time and intensity of your activity slowly.